When creating a perfect invoice, there are a number of things you need to remember and sometimes because of this, the design elements of the invoice is forgotten. Before we get onto the design side of things I am first going to help you by providing a checklist to ensure you have all the relevant information present on your invoice. Most of these should be obvious to you, but sometimes when you’re trying to remember everything it is very easy to let a few of these slip through the cracks. Now you should be ready to get onto the important stuff, designing the invoice! The design is crucial when creating an invoice, in some cases, it’s the last point of contact you have with a client and I’m assuming you want them to use your services again so you really need one last attempt at staying in their minds. If you can create a stunning invoice (yes this is possible!) then you are helping your business in more ways than one. There is nothing worse than buying a fantastic product or service from a company and when the invoice arrives, the cluttered layout and tiny text makes it difficult and infuriating for you to decipher when you are trying to pay your bill and to top it off, they’ve forgotten the contact details! The previous feelings of happiness you once experienced with this company is long gone, and this is a feeling you don’t want to give your own clients. Next, I will share with you the crucial elements of designing an invoice, don’t worry too much if you don’t understand some of the elements below, in the next section you will see examples of great, creative layouts that should aid you through the process of making a stunning invoice. Layout – There is nothing worse than seeing an invoice, or any document for that matter, poorly laid out. If you’re not sure how to lay out your invoice, follow the standard layout of a letter, making sure the relevant information is in the right places. Try and make certain pieces of text in your invoice line up with other pieces, this makes your invoice look a lot tidier. Consistent branding – First off your logo should absolutely be present in your invoice – how else are clients going to know where this invoice has come from and no, your company name written out in 8pt font won’t do you any favours, remind them of who you are with your exciting logo! Secondly, if you’re feeling exciting, add some elements of your brands colour within your invoice. Don’t be afraid to experiment with coloured shapes and subtle backgrounds – be creative but do not overwhelm your client. Carrying on from the consistent branding, if your company uses a simplistic, minimalist style then bright colours, shapes, etc. isn’t the route to go down with your invoice. Similarly, if your company has fun and playful branding, a basic black and white invoice will not reflect your company at all. Typography – Make sure the font that you use throughout your layout is clear and easy to read if you find yourself squinting trying to work out what you’ve just typed out, then do not use that font. Print out your invoice designs regularly to work out whether the font needs to be bigger or smaller if you’re unsure I recommend size 11 or 12 font on a standard a4 invoice. 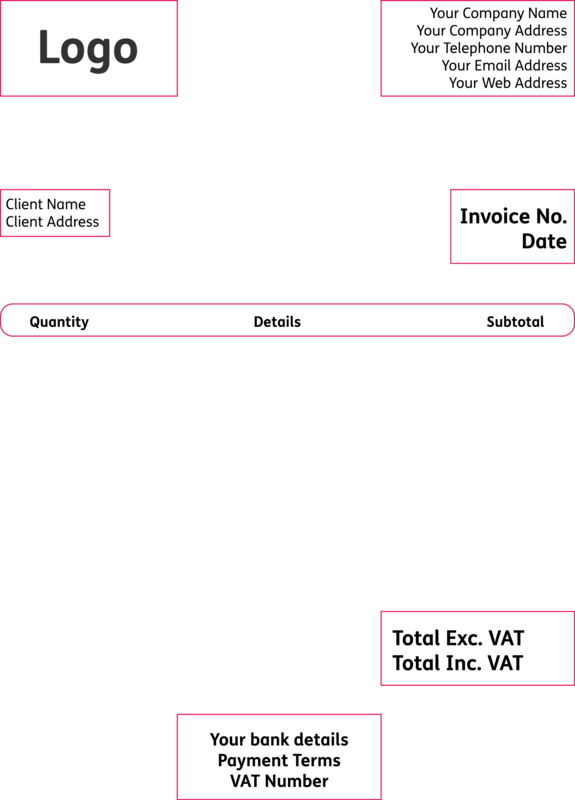 If you are struggling with the initial structure and layout of your invoice I have created a basic invoice layout diagram for you. Now, this is layout contains everything we have discussed above in terms of content and it’s all in the right places. 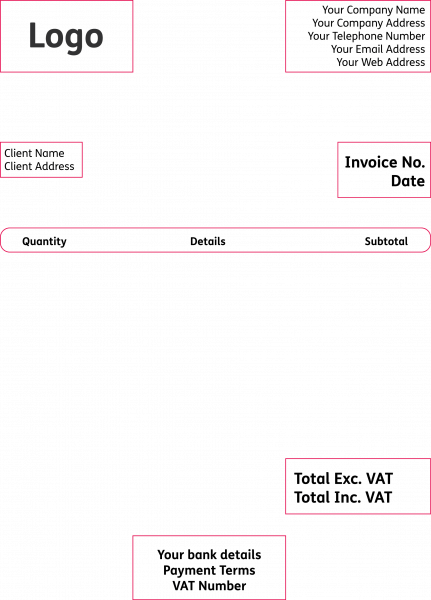 Design-wise, however, I definitely recommend you do not design your invoice as simple as this. Be brave, add some colour, make it reflect your brand and make it memorable! Print out your newly designed invoice! Give it to a relative or friend, preferably someone of an older age and ask them if they can read it, get them to tell you whether it is clear enough and if the right information present? If they can read it with no issues then you should be ready to utilise your new invoice, good luck! 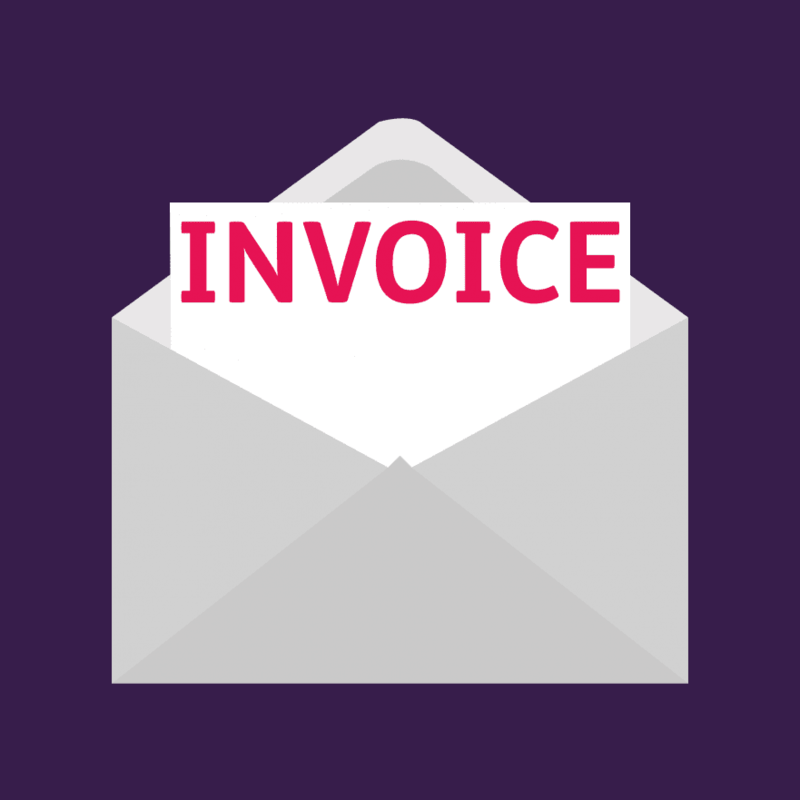 Do you have any top tips for creating an invoice? Please let us know your thoughts by leaving a comment below!